When the inquisitive engineers at Milwaukee Tools started asking professional carpenters what they wanted in a portable circular saw, they consistently heard the same three things: pure cutting power, maximum control, and all-day comfort. 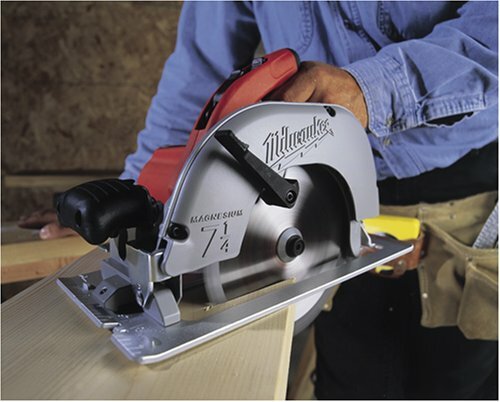 The result of their research went into the creation of the Milwaukee 6391-21, arguably the best-built circular saw on the market. For starters, the 6391 has a monster 15-amp, 5,800-rpm motor that produces 3-1/4 horsepower; that's nearly as powerful as a worm-drive saw, yet this 7-1/4-inch Milwaukee model is more than one third lighter. Look closely and you'll notice that the blade is mounted on the left side of the motor. That southpaw position gives right-handed users a much clearer view of the cutting line since they no longer have to lean over their arm to see the blade. The 10.4-pound saw's thick aluminum shoe tilts up to 50 degrees for bevel cutting. Circular saw, carbide-tipped saw blade, blade wrench, storage case, and owner's manual. I am not sure if it is just me but out of the box, I found that at best after 3 or so feet into the cut with the help of a fence consisted of a spare sheet material to guide the base alongside, the saw likes to get stuck, deviates from the straight line, and pretty much messes up the perfect straight line cut. the line deviates from 1/8 to no more than 3/16ths from the line. Material I have used this saw on is 3/4 MDF and plywood. Both have the same results. This is with the stock blade that is included. It seems the blade gets loose over the course of the cut adding to the way it gets off course. I am starting to readjust my methods and using this saw for a purely sloppy (and slow) cut and using the same sheet fence on the piece, adjusting that for my VERY RELIABLE TRITON ROUTER to finish the edge. This is probably the first time I truly regret a purchased tool. The official milwalkee edge guide (sold separately) for the saw isn't worth anything in my book. I thought I can't go wrong with the Milwalkee brand. I have used this saw for four years working on my house. It has power. I have cut concrete, stucco, wonderboard, and lots of DF/HF and pressure treated lumber. The tilt handle thing is worthless to me--every time I adjust it, I seem to put it in the same place, where the handle is on all saws. Left cut is a poor idea for right handers. The real issue though, is that when I broke this saw and took it in for repairs, the repair cost made keeping the saw unrealistic. On a kick back I broke the gear housing. It was a careless setup on my part, but kick backs are going to happen, so there you go. Build quality on this saw is okay but not great. According to the repair folks, the problem is that quality is declining thanks to Chinese parts, but replacement part costs are higher than ever, thanks to Milwaukee. I just purchased a DeWalt 364K--it looks a little tougher. I need a sidewinder for some of my work, or I would just buy the HD77. The Milwaukee is okay, but really does not measure up against the big worm drive saws. The tool repair folks are not impressed with this saw, and they see them now and then. Bought this to place a heavy worm drive saw for cabinet making. This is a really nice saw except for the base plate. It is made of aluminum and has raw edges on the sides that are not machined very well. Not a problem unless you use a saw guide like I do. I actually sent back the first one as the base plate had such rough edges that it would not follow the saw guide well at all. If they would just use one of thier new composite base plates with the turned up sides, this saw would be great! Hint, hint. Tested a left handed saw - but didn't care for that manufacturer. A friend had a right-handed Milwaukee. Never bogged down. 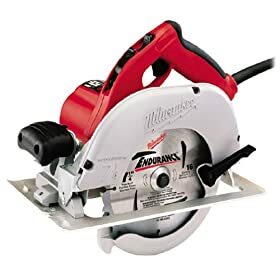 I'm a contractor and use this for cutting through wood (PT, plywood, pine 2x6, etc) also have cut through aluminum skinned panels. Like butter! I think I hear the saw laughing - looking for a challenge. Do it right, buy it once and get on with your life. Southpaws need not buy this tool! Amazing how long it has taken to start developing a line of standard circular saws for right-handed users! I have been using a Craftsman saw I bought 20 years ago, and was always annoyed at having to 'peek around the back' as well as coordination of pushing a little button in advance of being able to pull the start trigger. That saw just became my 'loan-out' tool when others ask to borrow. I've always been a big fan of Milwaukee, especially their Super Sawzall, and was not surprised to see the 6391 saw to be well made, and certainly it is designed for RIGHT HANDED persons like me. Key features about this saw that worked very well include the large lever to loosen the baseplate for depth of cut, arbor lock button (no more shoving nails/screwdrivers thru holes in blade to secure), adjustable handle position. While I haven't done any 'drop tests' on mine yet, the baseplate of aircraft quality aluminum appears hefty enough to take some moderate abuse. If any complaint at all...nitpick, I wish the tool for the arbor bolt had a place integral to the saw...like my Craftsman does. This would keep me from having to keep track of it, or keep it in the huge case the saw arrives in. First of all let me say that if you're a lefty and have never used a left-handed saw, you don't know what you're missing....BUY ONE!!! As for this particular saw, I was VERY pleased with its weight, construction, and ease of use. I used it a moderate amount during its first project and it performed wonderfully. I was pleased with the purchase and would buy it again. It came in a HUGE plastic case that is unnessesary, but could be a tool case for your son or a barbie chest for your daughter. Get the saw, it works great and doesn't cost an arm and a leg. Happy cutting! Power, balance, adjustable grip, Smooooth, this is a great saw. I have a Craftsman and Black and Decker but this saw is the best I have used. 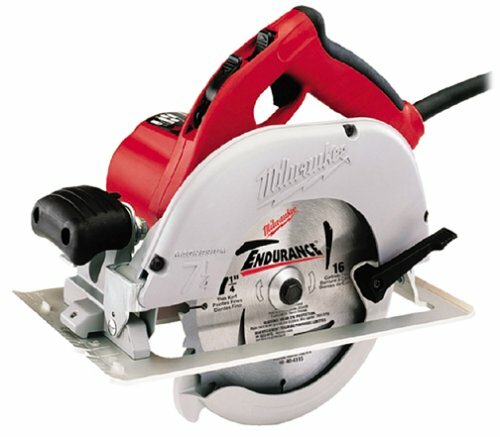 I did extensive internet research and in 3 different reviews the Milwaukee 6391 was the top rated saw in its class. I have to agree, this is a heck of a saw. With the right blades it cuts 1/2 inch and 3/4 inch ply like butter. Keeps a straight cut and it is easy to see the blade while cutting. Also comes with a nice case with room for a couple of blades. Note: the allen wrench to remove the blade is stored in the saw handle not the case. excellent. light weight, easy to use and the adjustable handle is a nice feature too. Left handed is a chalange in this right handed world of ours . I hardly ever use a circ. saw because the saw dust blowes in my face , That is until now . No complaints at all. I love the adjustable handle angle. More than enough power for general carpentry needs. I'm not planning on using it on concrete or anything of that nature, so I can't comment on its performance in that category. The left-hand blade took some getting used to as my old saw was a cheap B&D model. Love it now. I needed an alternative to my skil 77 wormdrive, it was either this or the Porter Cable so I went with this one. I am a pro, so I use it daily. So far it performs as expected. Mitre adjustment works well, depth adjustment works well. Havent tried the handle adjustment (and you probably never will either) The only negative seemed to be two raised indentations on the plate which needed to be filed down. Plenty of power, well balanced.